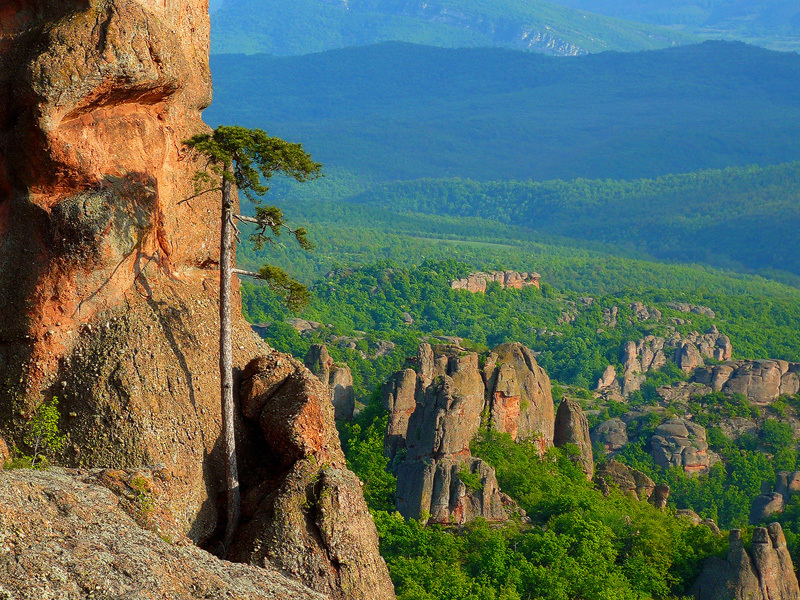 The Belogradchik Rocks were declared a natural landmark in 1949 and soon included in the 100 national tourist sites. In 2009 the question arose whether the rock’s layout, their remarkable complexity and intertwining forms, rather than their size, can withstand the test against challenges like the Amazon River and the Iguaçu Waterfalls and to join proudly the list of the new seven wonders of the world. This time Belogradchik failed, but each of the sites proposed, whether recognized or not, has its own beauty and history, which in its own distinguish them from the rest. And the tourist site marked under number fifteenth of the National Tourists Sites of Bulgaria still has a few trumps in its sleeve and doesn’t stop to surprise us. One of these trumps may be the look cast over the rocks from the ultimate tower of the Central Group, which reveals the columns growing in bunches or perhaps the sailing throughout the history of the region – myths, legends and history. From the legends accompanying the various formations with explanations for their strange and weird shapes to the remarkable but entertaining hypotheses about the interference of some ancient civilizations – each of the rocks tells its story to the traveller. One of the most famous legends is about the beautiful nun and the rider. The rocks, characters of this story belong to the central group of Belogradchik – the so-called “Horseman”, “Monks” (‘Nuns’) and the “Madonna’” – are the petrified images of sister Vitynia and the young shepherd Luke. A child was born out of their relationship and Vitynia was banished from the monastery. When Luke went down to her to help her, the earth shook, a lightning destroyed the monastery and the nuns, the Madonna and the rider were petrified to stand as a memorial to this day. Nearby is the rock group consisting of the “Dervish”, the “Schoolgirl” and the “Bear”, which tells the story of a young Dervish named Abdi, who slandered the man loved by the schoolgirl Latinka with accusations of rebellion and went alone to intercept her at the rock of love rather than the young Milotin. Latinka understood the fraud and ran down the rocks, but fell into a carnivorous bear’s den. As a result of Latinka’s prayers the three of them turned to stone, washed by the brook of Milotin’s tears. Other myths, trying to shape in words the history of the rocks, accompanied the rocks named the “Lion”, “Adam and Eve”, and “Hajdut Velko”. But they do not stop there. An example of the limits of people’s imagination is the names of rocks such as “Pinocchio”, “Dinosaur” and “Charles de Gaulle”. The formation of the mythical rocks began in the late Palaeozoic era when Belogradchik was consumed by the fury of the sea. Under the influence of subsequent tectonic cycles, the water has begun to draw away and finally this fairy tale of stone came to the surface. Temperature and the destructive forces of water and wind have patiently carved the sculptures for centuries. The increased content of iron oxide, in its turn has contributed to the deployment of a range of colours to a rich purple colour so well known to the passengers.